We have a used set of WP Pro 2pc brake rotors for the BMW M3 E46 with the CSL brakes. This set was used for 1 track day. Rotors are in good working condition and show minor stress. Great to use for the street. Can order new discs and hardware if needed later on. This is a steal for a pair of rotors. The BMW E46 M3 is one of the most iconic M cars to date which has become extremely popular for track enthusiasts. 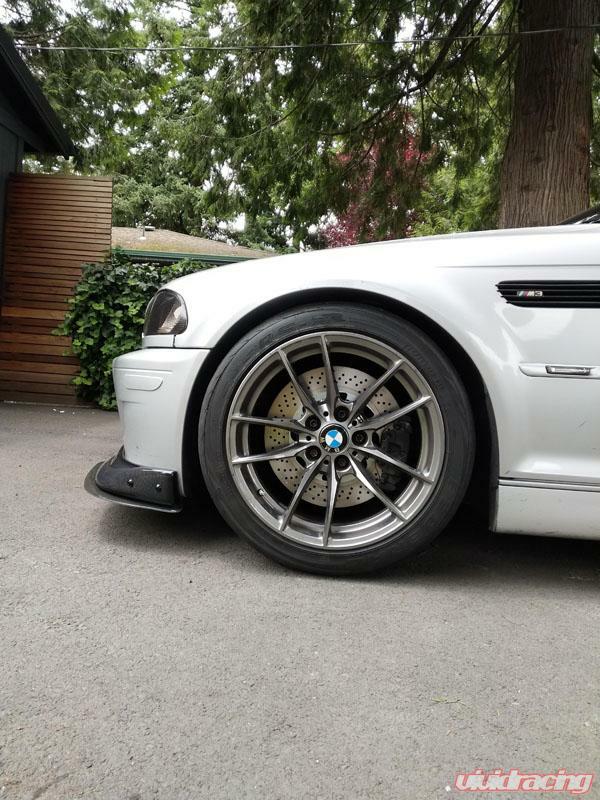 One of the most important upgrades for the car is the brakes. 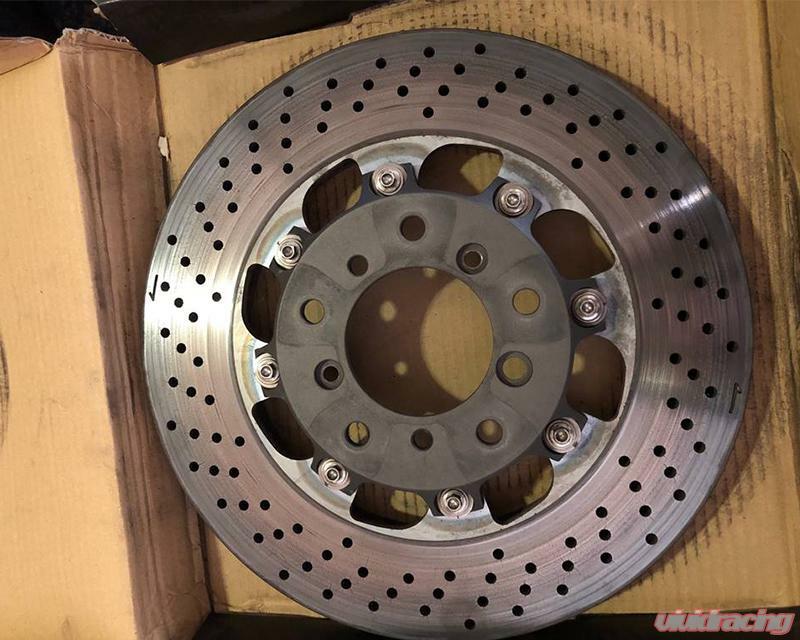 Most E46 M3 enthusiasts go with the CSL upgrade which includes an entire new brake bracket assembly to run the larger rotors. Many companies make a CSL upgrade option, but only have a 1 piece or semi floating 2 piece rotor. 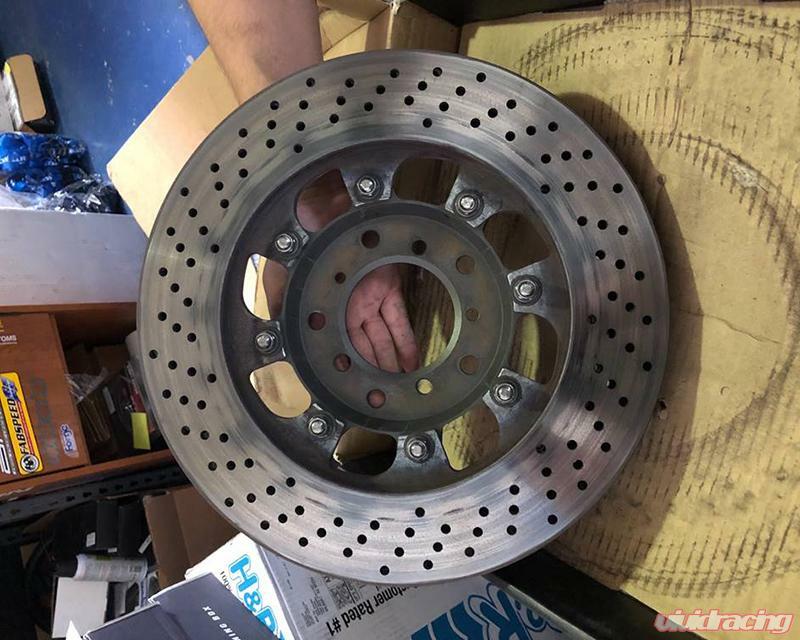 The WP Pro brake rotors upgrade you from a 325x28mm to a 348x28mm that is a full 2 piece fully floating design with 32 vanes for the best braking possible. 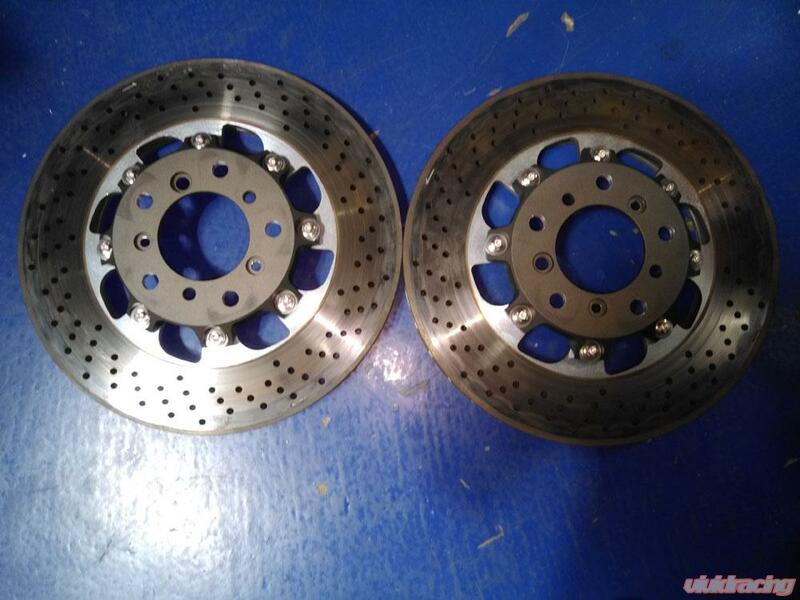 This front brake upgrade is a direct fit for those that already have the CSL upgraded brakes. Better braking means you can go faster into the turns, which gives you faster lap times to be ahead of your competition. To improve your braking, you want to have better heat dissipation, even brake pad wear, and a firmer pedal feel. One of the biggest advantages of doing a brake upgrade is the rotational weight savings. The factory brake rotors weigh 19.1lbs. The solid disc surface lacks the performance of light weight 2 piece rotors. The WP Pro rotor weighs only 16.9 lbs which saves you 2.2 lbs per corner over stock. Rotational weight savings has an estimated factor of three. This is like taking 6.6 lbs of dead weight off each corner! The WP Pro rotors feature a unique Sun Cut pattern with the drilled holes. Because the rotor features rotational drilled holes and more effective curved vanes, it helps dissipate heat away from the rotors. This design is used to improve cooling by pushing cool air from the center of the wheel to where the rotor needs it most. It also acts like a heat exchanger to carry heat away from the rotor. 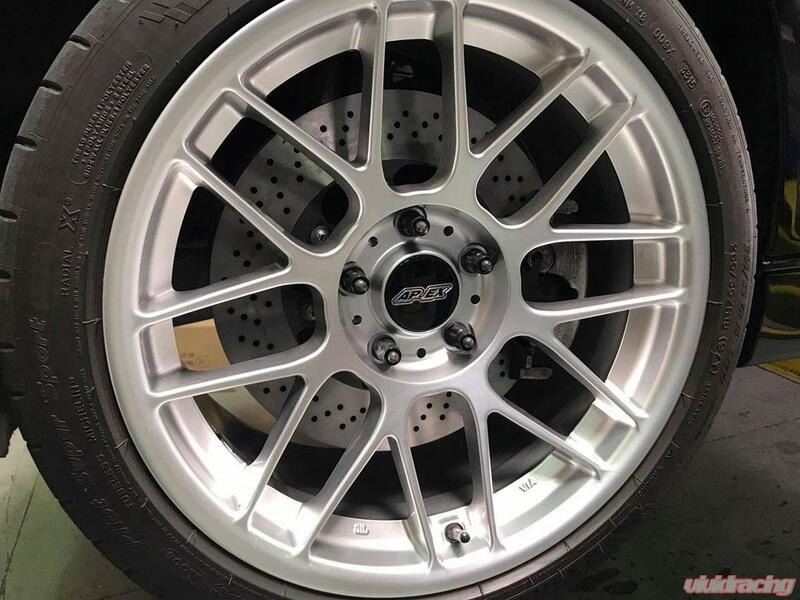 With the 2 piece rotor design and the improved cooling, the brakes pads have an even wear on both sides and almost no brake fade.